. . .a broad variety of services to address your needs. . . Thanks for your interest in our website. I hope we may be of service to you! My name is Greg Rister, and I am the founder of Rister Pipe Organs, located in Whittier, California. Pipe organ work has been a major part of my life. I first began learning the trade during the 60's and 70's with my father's part time organ repair business, and got hands-on experience with pipe organs during the installation of a pipe organ in our home. Subsequently, I re-apprenticed for four years with Rosales Organ Builders, Inc., in Los Angeles, and spent 10 years with Pipe Organ Craftsmen in Pomona, a service organization founded by Duane Hanks. I am a member of the American Institute of Organbuilders, and the American Guild of Organists. I believe that every pipe organ should be the beneficiary of quality work and high standards. You should expect nothing less. We will be pleased to offer a quotation for the work that you need. 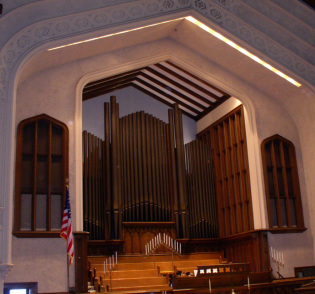 Presently, RISTER PIPE ORGANS is involved in many exciting projects, including the installation of a 42-rank pipe organ in a church in Torrance, California. Check out our catalog of work to see what we've been doing, and how we do it. Major rebuilding work, with or without additions.